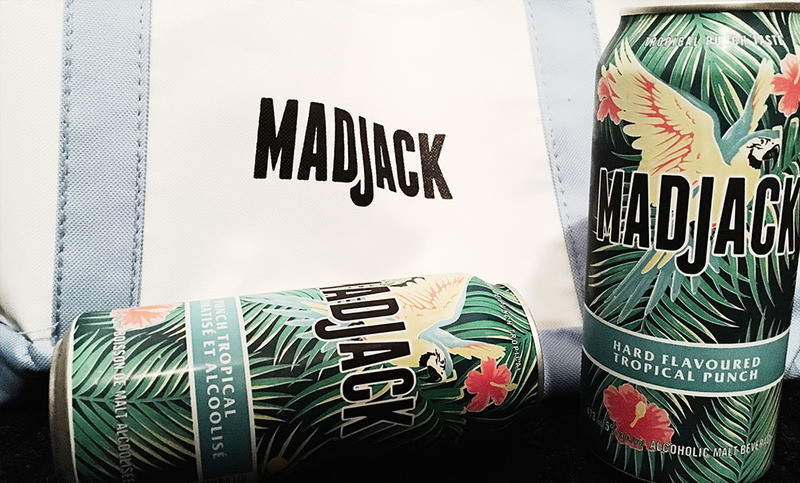 Mad Jack is malt-based canned beverage brand created by Molson Coors Canada; their line started with an apple lager and evolved to include such wonderful flavours as lemon lager, iced tea and root beer. This past summer, they released their summer-inspired Tropical Punch, in Quebec only. Mad Jack Tropical Punch is a malt beverage; it is made with malt liquor, carbonated water, and a bunch of other things that look like regular ingredients but aren’t exactly. When I first tasted it, I was expecting a cider flavour, because that’s what I’d remembered Mad Jack to be. It definitely isn’t cider flavoured. Nose of pineapple and mango, reminiscent of a smoothie I used to make when I worked at Ben and Jerry’s. Flavour wise, malt is there, hits at first before the tropical fruit flavours come in. Then we’ve got pineapple and mango – though they are hard to distinguish – with peach in there. Some citrus, as well – which makes sense with the citric and malic acid added to the mix. It tastes like someone said “give us stereotypical tropical flavours” and they did. Lingers a bit in the mouth, not unpleasant. Carbonation adds a bit of fuzz to the sip and probably mellows out the flavours.